“Do I look crazy to you? Unhinged? Antonio Banderas will never succeed in emulating the role he played in “Desperado“. There was a flare-up in “Automata” and “The 33” a while back, but for the most part he only plays in standard films which deserve the label “B-Film” most of the times. Usually the acting isn’t the cause, because that remains of the same level in every film. It’s always a different facet what makes the film to fail. In “Black Butterfly” the end was disappointing. And “Security” was no more than an adult version of “Home Alone” in a mall. I was hoping after seeing “Black Butterfly” that Banderas wouldn’t be showing up in an endless series of crappy B-Films. Well, I’m not hoping that anymore because this movie is surely a textbook example of a B-Film. No, again it’s not the acting that causes annoyance, but it’s the content this time. Before you know it, he acts like John Wick. I can understand that a person can’t forgive himself because he gave priority to his work as an excellent lawyer, who managed to keep criminals out of prison thanks to his smooth tongue (80,000 words a day according to him. That’s one word per second in 24 Hours. Amazing! ), instead of spending time with his family. The fact that this ends up in a period of self-punishment and joining an illegal fighting circuit where his face and body are heavily rearranged by others, after his lovely wife and daughter were killed while he was signing legal papers, is also understandable. But when that same person, who usually just argues in a courtroom, turned out to be expert in the field of martial arts after a few private lessons and thanks to some stretch exercises and feints around a boxing ball, it starts to feel a bit exaggerated. Before you know it, he’s driving through the city in a Ford Mustang in search of the perpetrators and starts beating up every person who gets in his way like a full-fledged John Wick. What a wondrous change after discovering an old book. Every conceivable cliché from an 80s action film with a vengeance theme was used in this film. Perhaps the vow of silence Banderas made here is an added value. To be honest, this was no added value for me. I like that English with a Spanish accent that Banderas uses. That your hearing will improve when another sense is not being used, can be true. But, the fact that Frank Valera suddenly can hear as well as Daredevil after such a short period of time, was a bit over the top. 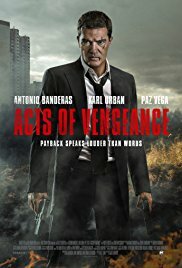 And before you know it, he’s joined by a German shepherd and a devoted nurse (Paz Vega) after a collision with a gang. Then there’s also a policeman (Karl Urban) who makes it clear that the investigation is a dead end. And finally Frank tumbles through the display case of a bookshop where he discovers a copy of “Meditations” by Marcus Aurelius, stained with his blood. A devilish move of destiny, because this book teaches him to control his spiritual ability, resulting in him observing things better and getting his body and mind in a balance. Brilliant, not? A plain average revenge movie. Nope, this movie wasn’t really impressive. The most impressive part of this film is the scene at the cemetery. The conversation between Frank and his father-in-law is the highlight of the entire film. An intense conversation in which the old man makes it clear to him that those responsible for the death of his daughter are at the same time the crooks Frank’s defending his whole life already. The rest of the movie is just average film material. I had a hunch about the perpetrator already at the beginning of the movie. Sorry, Banderas. You have to choose a more original script to impress me again!